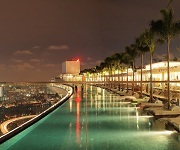 The following is a list of the Top 10 cheapest hotels in Phuket with free WiFi. I update this list regularly and if one of the cheap Phuket hotels listed below do not have free WiFi please come back and let me know. 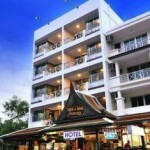 The Sleep Sheep Phuket Hostel in Phuket Thailand is one of the cheapest hotels on the island. This cheap hotel is also the cheapest hotel in Phuket that offers free WiFi. If your on a budget then you can't get more budget than this hotel in Phuket. Surprisingly though this hotel is in good condition the rooms are very clean no tv's in the bedroom but there is a common room.For more information or to book a room click here. This Little Mermaid hotel is a find, for the price what you get is awesome. And for such a small place it still has room service, a stocked fridge, a large restaurant you can get a half decent breakfast at as well. The Siam Hotel is a basic hotel, which is why it's on this list of cheap hotels in Phuket. The only amenity I guess is the free WiFi connection. The Dinar Lodge isn't the cheapest hotel in Phuket for sure, however it does come at a good cost for the location. The rooms are very tidy and if you like a hotel with a bit of sophistication and modern feel to it then you'll enjoy the Dinar Lodge in Phuket. 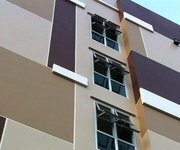 People rate this hotel in Phuket value for Money. 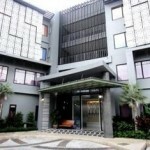 For less than $20 you have a very clean and tidy room, the room is quite large with own private patio. Surprisingly also that it has 24hour room service at a hotel that is so cheap. 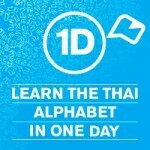 It is in Patong but a little bit away from the beach still I say it's a cheap way to stay in Phuket. You'll feel at home at the At home Hotel Two. This hotel in Phuket has a very nice bar area as well, they really make you feel at home at this family run hotel. The Paradies Resortel is a different kind of hotel to the rest. 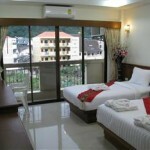 Located in Patong and walking distance to the beach, for the price you really can't go wrong. The location is what makes this hotel what it is and why so many people seem to like staying here. If your not in your room that long (only to sleep) then this is a great hotel. Free WiFi in the bedroom too. Not a bad place to stay, however most of the rooms are really tacky, with funky coloured walls. Think the owner must be color blind! But it's not a bad place to stay, more of a backpacker hotel in Phuket though if that's your thing. The Case E Mare Hotel is a typical Thai style hotel that a lot of Thai people like to stay at so it's not really a backpacker place. Not a bad cheap hotel in Phuket for you and your girlfriend though. I don't know why but I really liked the Little Mermaid resort, even if the pool does look green (it's perfectly clean though it's just the colour).It's away from the beach but has an awesome view of the beach, guess you can't have everything.